"Hala kahiki is the Hawaiian word for pineapple. This is a seven-ingredient smoothie that is rich in vitamin C and other nutrients. Spinach gives it a beautiful green color yet it tastes tropically sweet. Great for breakfast or a mid-afternoon pick-me-up. Can adjust ice or water to achieve desired thickness of smoothie. I prefer mine not very thick." 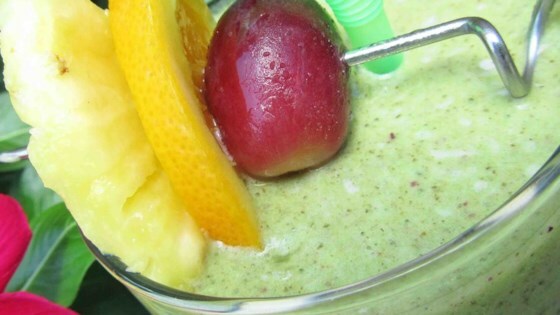 Blend oranges, spinach, water, pineapple, grapes, ice, and flax seed in a blender until smooth. This tasted great. Not a hint of spinach. Will mire likely freeze the grapes next time. We really liked this and will make it again.. but I will squeeze the oranges not really crazy about that much pulp.. Very different tasting to me. Some in my family really liked it and some not as much.